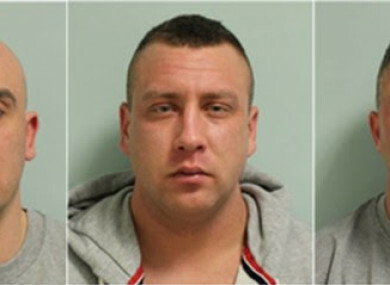 THREE MEN WHO stole hundreds of items of property from homes across London, including the ashes of two children, have been convicted. A box containing the ashes of two children were stolen in a burglary at a house in Castlegate, Richmond during the afternoon of Monday, 11 December. Along with items of jewellery, a maroon box was taken which contained the ashes of twins who died at birth. The theft of the ashes left the family heartbroken. Marcin Lipiec, 37, Daniel Majewski, 26, and Piotr Pawlark, 32, all of Wills Crescent, Whitton, pleaded guilty to conspiracy to commit burglary at Kingston Crown Court. They will be sentenced at the same court on Friday, 11 May. The victims were unable to get into their home as the front door had been barricaded from the inside. The property’s back doors were forced open and a safe, bank cards, passports and a laptop were reported stolen. Officers followed up on reports about a suspicious car and entered a premises where the car in question was parked on the driveway. They found a large safe in the living room which had sustained lots of damage from where the suspects had attempted to open it using tools. It was later opened by police and the contents were confirmed to belong to the victims of the Buxton Road burglary. Lipiec, Majewski and Pawlark, who are all Polish nationals, along with a 25-year-old woman, were arrested on suspicion of burglary. The three men were charged with burglary in the early hours of 14 December while the woman was released under investigation pending further enquiries. Officers also recovered more than 400 items of stolen property, along with tools often associated with going equipped to commit burglary such as crowbars, hammers and rubber gloves. Email “Three men who stole ashes of baby twins convicted over string of burglaries ”. Feedback on “Three men who stole ashes of baby twins convicted over string of burglaries ”.